Description: I have been in the midst of a payroll implementation, and led a training yesterday that got me to thinking about payroll quick entry tips. 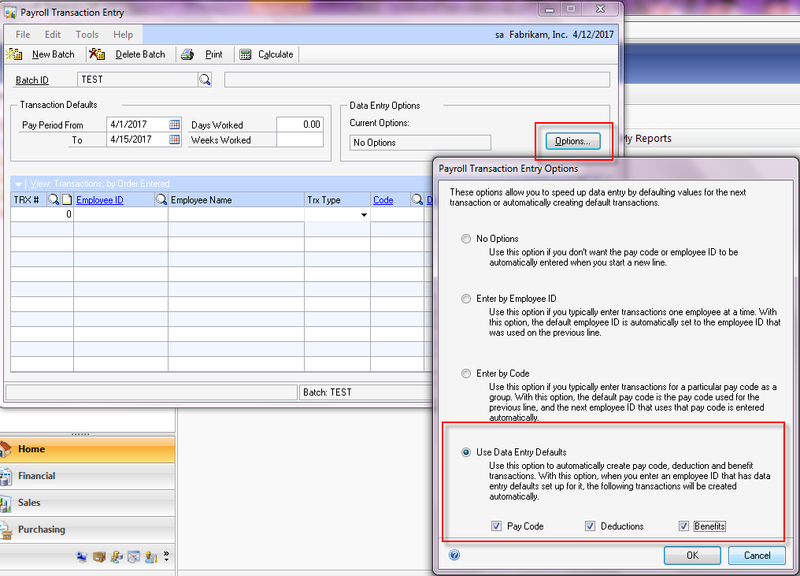 So here are some of my favorite ways to speed up the entry of payroll transactions. I think this has to be one of the most underutilized windows in Dynamics GP. Enter or select a Batch ID to be used for the transactions. Then select a pay code, deduction, or benefit and enter a date range and range of employees by employee ID, class, department or position . 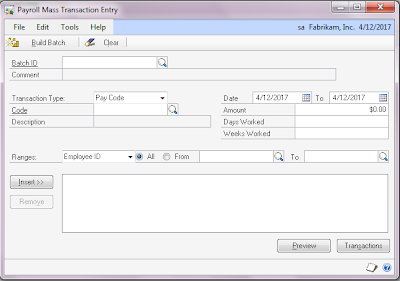 You can enter an amount if applicable, or leave it set to zero and you can edit them individually in the standard payroll transaction entry window. You can then preview the transactions to be created (the system will only create transactions for employees in the range who are already assigned to the selected code) and delete the transactions that should not be created. 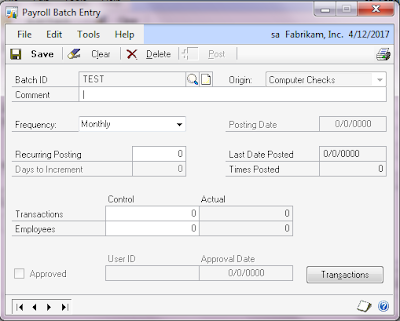 In the Preview Mass Entry Transactions window, click Build Batch to create the transactions. 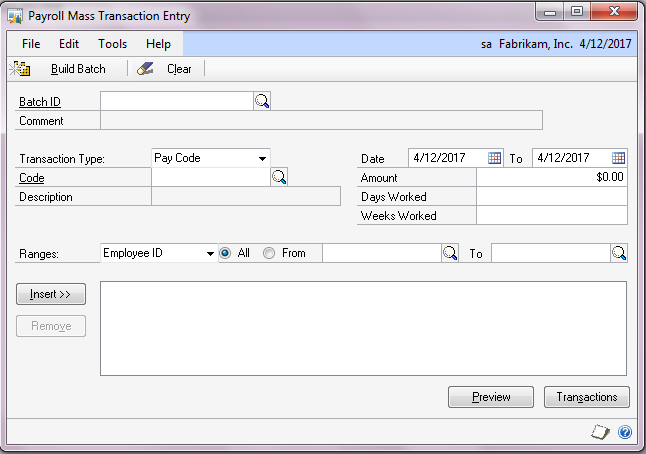 You can then edit the transactions, including the amounts using the standard Payroll Transaction Entry window. What can you do with this? Create holiday transactions for all of your salaried employees, create commission transactions for everyone in the sales department, and even create a year end batch of auto allowance benefits for employees in the manager position. By default, when you set up a transaction batch, the frequency is set to Single Use. This means that once the batch is printed and posted in a payroll, it will disappear. But pick a frequency other than single use, and the batch will recur after posting with updated dates based on the frequency. 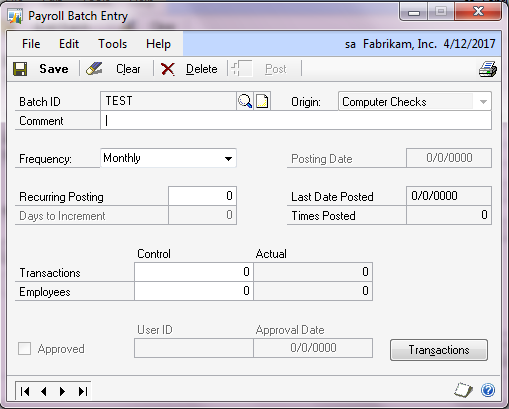 You can then edit the batch and make any necessary changes before the next payroll. This is perfect in situations where the amounts may not change from month to month, or there are only minor changes. For example, deductions for uniforms, benefits for life insurance premiums, or regular bonus payments. 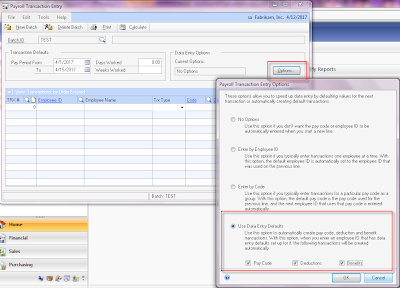 Ever wonder what the Data Entry Default option on Cards>>Payroll>>Deduction (and Setup>>Payroll>>Deduction) means? Well, it comes in to play quite nicely on pay codes, deductions, and benefits that require transactions (in the case of benefits and deductions, the Transaction Required option must be marked). In Payroll Transaction Entry, click on the Options button in the Data Entry Options section and choose "Use Data Entry Defaults" and select which records to default. Then when you select an employee in the Payroll Transaction Entry scrolling window, the records that are marked as data entry defaults will automatically appear. This is a great option when you generally enter the same transactions for employees each time, and the amounts vary. For example, if you manually key timesheets in to the system, you could set up both the hourly and overtime pay codes as data entry defaults and then you only need to select the employee to create the transactions and then enter the amounts. I am only half joking, integration manager is a GREAT tool for imports of payroll transactions from flat files. So if you have a download from a timekeeping system, or even just payroll transactions that you have calculated in Excel, think about using Integration Manager to reduce the keying. Please share your own shortcuts, I would love to hear them!